Last night we had a quiet night alone.HR was at a party and I had to work during the day. We did our little tradition when we are alone, champagne and hors d’oeuvres. 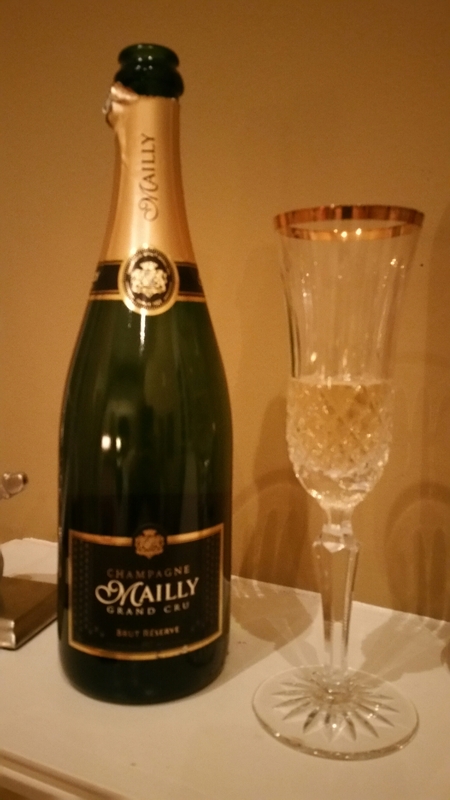 We toasted in the Year with Mailly Grand Cru brut reserve. Mailly is actually a village cooperative that produces some of the finest Grand Cru wines. There are only 17 villages out of 319 rated as Grand Cru. Mailly is the only one that sources all of its grapes from grand cru vineyards. The winery is built on levels of caves that were hand dug and go down several stories, adding to the ambience of the winery. As soon as you pop the cork the very delicate bubbles flow over the top of the bottle. Fine,elegant soft bubbles. The delicate taste of fruit, a little citrus with light hints of toast. Soft, delicate mouth watering. Alot of the”popular” are over toasty and leave the taste of stale bread. Comes from the yeast. Many people say they do not like champagne. Too bitter they say. I say they have never had a good one… Mailly. Next Post: Chateau Kirwan, An Irish Bordeaux? ?